The sad fact is that a huge number of women and babies are still dying unneccesarily in Pakistan due to lack of proper healthcare infrastructure, lack of skilled staff, use of traditional customs by dai, remoteness of their village, etc. During this trip, I’m staying with my host family, who all are doctors, mostly gynecologists, and who have been my guide and support in the past years. The experience is and has been heartwarming so far and gave me a totally different view on life here. You become a part of the household and slowly start to get to know the whole family and the staff working here. And the fun thing is that everyone starts to get to know me too. Moonie, our cook, for instance knows of my addiction to the incredibly tasty Pakistani mango by now and with love sets the table and cuts a piece of this delicious fruit for me. 8 days ago though, after breakfast when we were trying to communicate in our simple way, as we both don’t speak each others languages, she was called outside. A family member had come bearing bad news that something happened to her daughter in Hyderabad and that she had to come immediately. Returning in the house, I saw the shock and fear in her eyes as she scrambled to get her things together. Later that day I heard the awful news that her daughter, who was 7 months pregnant from her 3rd baby, suffered complications during her pregnancy and both mother and baby died… Last week, while I was sitting on the terrace reading the newspaper, I saw Moonie returning to the house. I followed her in, where we hugged each other. It was an intense and devastating hug, Moonie crying from the depth of her soul… Feeling her pain, I couldn’t stop my tears either… For the first time in all these years, with seeing and experiencing many upsetting moments, this time it really hit home and became real and very personal. The numbers of maternal deaths that pop up in various rapports by ngo’s all of a sudden got new meaning, as one of these numbers now is Moonie’s daughter. In this moment I feel utterly helpless… I’m not able to do anything for Moonie, I’m not even able to communicate and tell her how sorry I am. Yet I hope that all the work I’ve been doing here, will make a difference in the coming years, will educate people about the situation here and will slowly improve the conditions in which women give birth here. 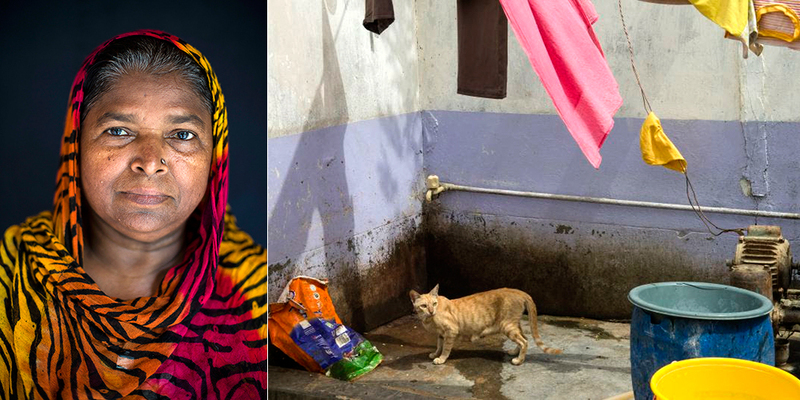 Wendy Marijnissen is a freelance documentary photographer from Belgium, based in Karachi, Pakistan. For the last 7 years she has been working on photographing maternal health stories in Pakistan. She was also a finalist for the Fotovisura Grant for Outstanding Personal photography project 2010 and received a honourable mention at the Photocrati Fund 2011 grant with her work ‘Every woman counts’. Her work has appeared in media like Le Monde, Arte, De Standaard, and L’Express. Follow her work on http://www.wendymarijnissen.com.